Yeah, OK, it’s a bit unfair to walk in on a building that hasn’t finished putting its make-up on before the big Cancan, walk up really close to it, and judge it for what you see: wrinkles that haven’t been filled with putty or flattened by Botox, unnatural curvature changes,Â incision marks, or wobbly suture lines unsoftened by foundation. But I’ll do it anyway. Close-up, the cluster of reddish-black globules on the entrance’s ceiling revealed itself as Prenzlauer Bogen’s first residents: an infestation of ladybugs that had already started to crap all over the acrylic render, perhaps drawn to its relatively mild surface temperature or hooked on its evaporations, a veritable ladybug crack house. Now, a key to preventing vermin infestations in exterior insulation is to ensure that the facade is properly sealed. Here, I found plenty of access points for insects to a warm, moist, hydrocarbon foam feast. But how did I get here, poking my 10x zoom at a lost hole in the acrylic render facade of this uninhabited building’s darkest recesses on a cold and dreary afternoon? I was immediately drawn to it when I first saw it. I was overcome by a reminiscence of the buildings of East Berlin, maybe ten, 20 years ago – paired down belle epoch buildings finished in uniform crude grey stucco that bore their fate with honesty and candor, stripped of all their ornament, either because the Commies thought of it as bourgeois or because they were too skint to repair what hadn’t been shot off in the war, or both. This building looks like that to me, like the former buildings of East Berlin, before they were subjected to the vandalism of sponge effects and pastel hues. It, too, seemed to have lost its ornament through a tragic event in history – only prior to its construction – a financial crisis, or the advent of some sustainability standard. 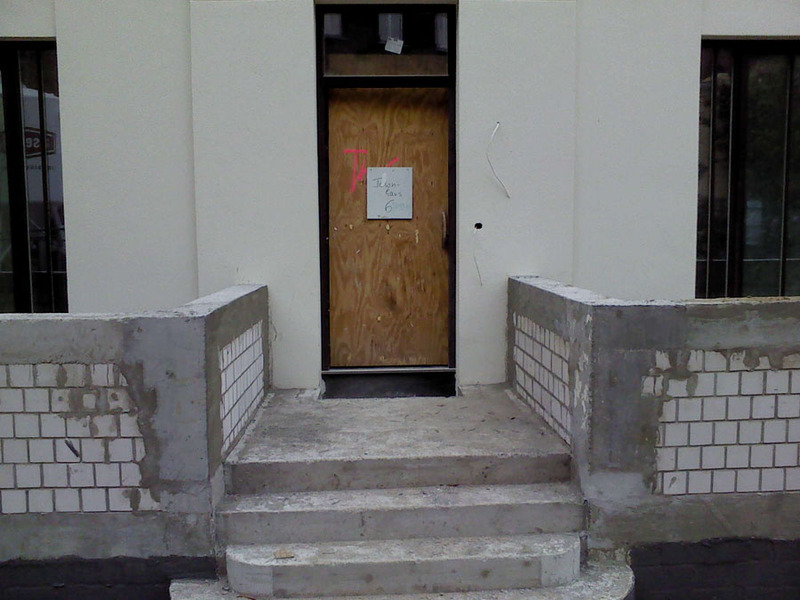 I was intrigued and studied architect Tobias Nöfer’s concept on the project website, but didn’t like what I read. Normally, developments of this kind aspire to places seemingly higher up the pecking order of cosmopolitan desirability, such as Rome, New York, or Paris. This example of “highest building art” (developer’s usual modest marketing blah) is taking things down a notch. The reference is of pulsating, cosmopolitan, Bath, England. Apparently, what we have here is a fine example of “Old English Crescent” (!?) an architecture style I had never come across prior to studying the project’s website, and of which there had hitherto existed but a single proponent, John Wood’s Royal Crescent in Bath, and now also, the Prenzlauer Bogen. If you find yourself trapped in the city of Berlin, but yearn for the quaint, slow-paced town life of a place like Bath and are a fan of “Old English Crescent”, this is for you. The historicist facade stripped of ornament invokes former buildings of East Berlin. Could this be an unintentional proponent of the critical regionalism in the Kenneth Frampton style? But why Bath? Why England? Don’t we have our very own Berlin crescent housing? Nah, that’s a horseshoe. This is a crescent, I mean a sickle, no, an arc (see the development’s concept). Yet, the stripped down historicist style lends this radial structure a penal appearance. By god, it’s a panopticon! At least if must feel that way playing in that sandbox and I wouldn’t worry about having your bike stolen.